EQUESTRIAN - WATERSIDE - Valley House is a charming late 17th Century former Mill House. 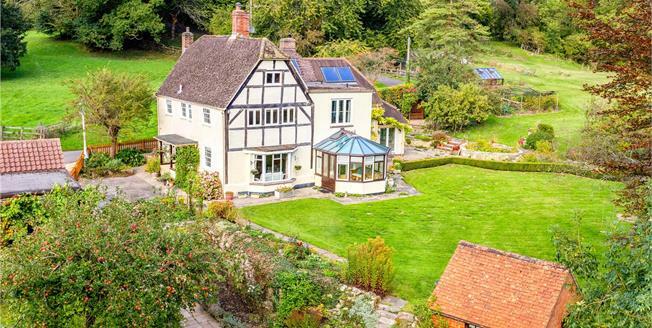 The original, and humble, Mill House has seen three substantial extensions since being built, all of which have been cleverly linked to create a large family home in this stunning valley setting. The current owners have been in occupation since the mid 1980’s and have put their own mark on the property with a substantial two storey addition creating a more family friendly house from which to both entertain and enjoy family life. Valley House is true to its name and set in a private and secluded valley, offering a true small-holding feel. Surrounded by open land it enjoys a wonderful vista from all rooms. It has a superb mix of land ideal for grazing, but including areas for growing vegetables, fruit trees and a meandering stream. This property is featured by our Equestrian and Waterside departments. The property is situated one mile from the historic market town of Devizes which has an attractive, predominantly Georgian market square offering an excellent range of amenities including shops, supermarkets, restaurants, cinema, museum, leisure centre. The area has well regarded schools including Dauntsey’s , Marlborough College and St. Marys, Calne. Devizes lies on the western edge of the North Wessex Downs; the unspoilt nature of the surrounding countryside makes it ideal for walking, riding and other country pursuits. The Kennet & Avon canal runs through the town with the spectacular Caen Hill flight of 29 locks to the west with a museum and wharf in the town centre. The A303 is around 15 miles to the south, with direct rail services to London Paddington (around 1 hour) and the South West from Chippenham, approximately 14 miles.